FORMER finance minister Ignatius Chombo amassed vast tracts of prime land across the country by grabbing the 20% commonage land which developers are mandated by the Local Government Act to reserve for the construction of government premises such as police stations, schools and offices, the Zimbabwe Independent has learnt. Local Government ministry sources this week said Chombo, who was Local Government minister from 2000 to 2015 before being appointed home affairs minister and subsequently finance minister, grabbed large tracts of land countrywide before converting some of the plots into residential stands which he sold at a premium. The principle, known as commonage, compels land developers to surrender 20% of serviced residential stands and all the commercial and institutional stands when developing state land to the local authority. Chombo used this loophole to amass a lot of land countrywide. Chombo’s vast wealth came to light during a messy divorce with his wife Marian in 2010. In court documents, Marian exposed that Chombo owned countless houses as well as a vast portfolio of commercial and residential stands around the country. She revealed that he had two flats in Queensdale, a flat at San Sebastian Flats in the Avenues as well as a property at 79 West Road in Avondale, 36 Cleveland Road, Milton Park, 135 Port Road, Norton, a house in Greendale, two Bulawayo houses, among other assets. He also owns the property at 18 Cuba Road in Mount Pleasant, 45 Basset Crescent in Alexandra Park, 1037 Mount Pleasant Heights and several houses in Chegutu and Kariba. Chombo had 20 stands in Crow Hill, Borrowdale, and 10 stands in Glen Lorne and some stands in Avondale. He also had houses in high-density suburbs including Glen View (two) a property in Katanga Township, four business stands in Norton, three business stands in Chinhoyi and four business stands in Banket. In addition, he had four commercial stands in Kariba, stands in Ruwa, Chinhoyi, Binga, Zvimba, Victoria Falls, Beitbridge and Chirundu. He also owns a commercial stand in Epworth. Chombo also owns vehicles which include four Toyota Land Cruisers, Mercedes-Benzes (three), Mahindra, Nissan Wolfs (two), Toyota Vigo, Mazda BT-50, a bus, Nissan Hardbody and a Toyota Hilux. He was seized by the military on November 14 when former president Robert Mugabe was placed under house arrest. He was dumped at his house on November 23, but was immediately arrested by the police. He appeared before magistrate Elisha Singalo facing three counts of corruption. In the first count, Chombo was accused of fraudulently forging documents that included a lease to acquire Subdivisions “K” Portion of Nthaba portion of Glen Lorne from City of Harare where he is said to have signed and fabricated a fraudulent lease agreement on January 1 1997. City of Harare is said to have been prejudiced of US$900 000. 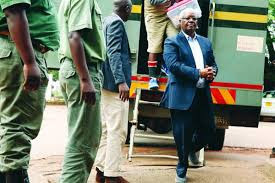 On the second count, which is criminal abuse of duty by a public officer, Chombo is accused of having received an application from City of Harare for a change of use for an open space in Helensvale into a residential area in September 2006. He allegedly used his ministerial power as the Local Government minister to allocate it to a company he co-owns, called Harvest Net Enterprises. The property is worth US$2,7 million.